William Inge’s 1955 play “Bus Stop” may be known best by its loose adaptation in the 1956 film starring Marilyn Monroe. But as Raven Theatre reminds us with its engaging take on this off-kilter comedy-drama, the wry charms of “Bus Stop” are native to the stage, the intimate stuff of a cozy diner in the middle of nowhere on a snowbound night. Perhaps it’s Inge’s peculiar collection of misfits, thrown together by an impenetrable storm, that make “Bus Stop” feel like a comedy. We find ourselves laughing, though sometimes uneasily, at the posturing and pathos of characters whose isolation in this little diner is transparently metaphorical. Just as they scarcely know where they are, none of them has a very clear idea of where they’re headed. The loudest of this motley bunch is a tall, strong, 21-year-old Montana cowboy called Bo Decker. As inexperienced as he is willful and self-absorbed, Bo is on his way home from a rodeo in Kansas City. He’s won some cash money at the rodeo and got a rise loan, but his biggest prize (as he sees it) is a pretty saloon singer named Cherie whom he has essentially kidnapped with the intention of carrying her off to Montana and marrying her. Cherie is less than enchanted; she’s terrified, and we soon come to understand why she views Bo not as a brash lover or even as a seducer, but as a predator and a threat. At its core, “Bus Stop” is the story of Bo’s metamorphosis from lout to, well, lout with potential – a transformation he makes with great kicking and hollering. The show flies or falls with Bo. In the strapping form of Michael Stegall, director JoAnn Montemurro has the raw, impetuous and alarming — but also very funny — cowboy she needs to fuse Inge’s elements of comedy and drama, wit and poignancy. The bus carrying Bo, Cherie and the mixed bag of other travelers makes its usual stop at the diner, but can’t continue because of heavy snow that’s blocking the highway ahead. 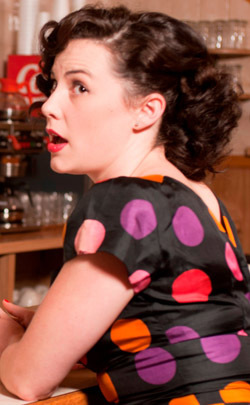 When Cherie bolts into the diner first, clutching her suitcase and frantically seeking asylum, you don’t quite know whether you’re looking at the opening gambit of a sitcom or a woman who’s genuinely terrified. 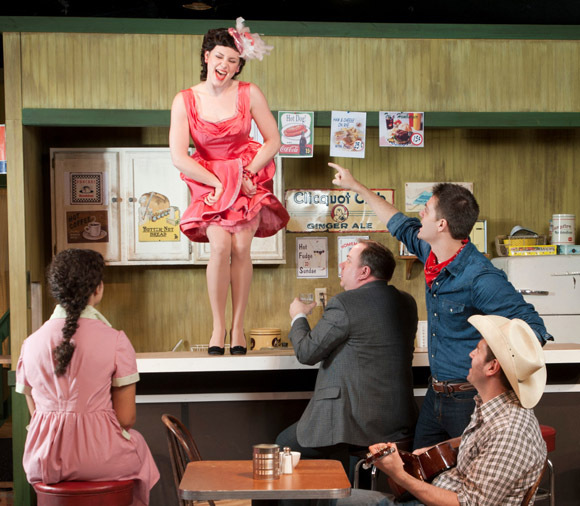 Jen Short plays that ambiguity to perfection – the hillybilly chanteuse (chantoose, says the proud Cherie) being pursued by some big ol’ cowboy. But then in strides Bo, this stallion in a tea house, ripping and snorting, his lip curled. He isn’t smiling, he isn’t solicitous. He is stalking, intent on snaring what he believes belongs to him. Cherie shrinks away, and we cringe with her. Indeed, Stegall and Short play this first round of hunter and prey with unsettling conviction. Yet it’s their dramatic arc, the carefully calibrated progression toward a kind of stand-off, that yields the true rewards of their performance together. Stegall’s bull-headed Bo is just a nature-boy who needs a little instruction in the art of love. It’s when the gentle pointers crash against the force-field of Bo’s brutishness that Stegall begins to display his range as an actor. This Bo is teachable; he just maybe needs the guidance of a firmer hand. And when that more purposeful instruction comes, Stegall begins to peel away Bo’s layers of orneriness until he gets down to the vulnerable orphan child at his center. It’s psychoanalysis lite, but touching. Among the other pilgrims huddled at this transit station to nowhere is Dr. Gerald Lyman, a college professor of literature, a man with a fondness for the bottle and young girls, whose life is a book of self-loathing. In the performance I saw, Jon Steinhagen’s muttering, angst-ridden professor sometimes swallowed his addled confessions even as he caught the personal terror of a man lost to the world. As his moral opposite, a laconic cowboy called Virgil who is Bo’s lifelong friend and father-figure, Mark Pracht gives a bedrock performance of few words but clear meaning. As the owner of the diner and her high school hash-slinger, Kristen Williams and Sophia Menendian make an appealingly down-home team. Antoine Pierre Whitfield is the sturdy sheriff and Dean La Prairie the amorously opportunistic bus driver. Designer Ray Toler’s 1955 diner boasts not only the period details but also the well-used look of a joint that’s seen its share of transitory drama. It is, after all, a bus stop.